Shadow Skills – a combination of rally obedience and canine freestyle moves. Learn how to direct your dog to follow you through a course and shadow your movements. Exercises include heeling on both the left and the right, spins, crosses, backup, and pace changes. Improve your leash walking and basic obedience skills while keeping it fun and interesting for both you and your dog. No Need for Speed Obstacle Skills– Navigating this course does not involve speed but rather the ability to perform challenging obstacles through teamwork. Exercises include jumps, hoops, mini-tunnels, the step bridge, the ladder, cavalettis, mat games, turn the light on, bang-it board, ride the scooter, retrieve, and more! This division tests your dog’s proprioception and obedience skills. A favorite of both dog and handler. Sniff It – WIG Sniff It is a simplified version of canine scent work. We begin working with finding the food scent, and then begin to introduce finding the handler scent. The dog must alert to the handler which canister has the appropriate scent. It is fun to watch each dog develop their own style. 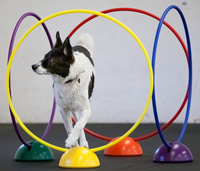 Dog Ball – Teach your dog to push a ball (usually a soft exercise ball) through a course of gates and hoops. This is a fun skill to teach as it takes patience and precision. Your dog will learn to push other articles before he begins working on the ball. Your dog must learn self-control before he can begin interacting with the ball.